I went by The Purple Purl on my last expedition to the big city on Friday, and they have some wonderful new signage in their washroom. I don’t know where it is from exactly, though, which is a bummer because if I did, I would tell everyone I know, and probably buy ten copies. It’s funny because it’s true. I have spent the last few weeks knitting like a fiend trying to finish up a few design projects and finally the finish line is in sight and I’ll be able to show off a couple of them to you this week. As much as I love designing, I’ve never had a time with this many design projects on the go at once before, and I am very much looking forward to knitting something that does not require me to write down instructions for someone else to knit the same thing. 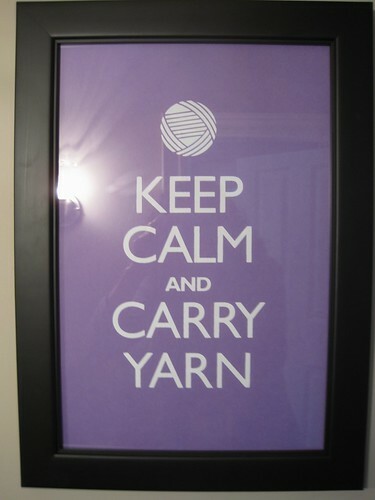 Keep calm and carry yarn. Oh, that sign is ALL over the place here in Boston — you can buy it at the bookstore, HomeGoods, all sorts of places. Even Amazon is selling it now. I see other people on Esty are selling key chain and bag and t-shirt and apron versions of it too. I saw this on a tote someone was carrying yesterday at Maryland Sheep & Wool. It is definitely true! You can also get a variety of items with that saying (and several others!) at http://www.CafePress.com. they have t-shirts, magnets, coffee mugs, tote bags, etc., with that and other knitting related artwork. Just search “knitting”, and you get pages of items! That is too cute & great advice. Although I’m not especially fond of cupcakes, personally, I enjoy the “Keep calm and have a cupcake” variant on this theme. That Is a wonderful sign. Whitney is on to something. A ball of yarn in the purse for those stressed times. Great idea. I see it on a knitting bag. Someone could make some $ putting that on a knitting bag. The design “Keep Calm and Carry On” is based on the original WWII poster commisioned by the British Government’s Ministry of Information. If I’m not mistaken, I believe Ravelry had a pole for which color us knitters would want the above saying in a poster form to be sold on Rav. Great poster indeed! it’s also on Cafe Press. i have been eyeballing the same sentiment for quite a while (maybe today i will just go ahead and order, i don’t really know what i’m waiting on). http://shop.cafepress.ca/keep-calm-and-carry-yarn – totes, shirts, notebooks, etc. your new designs are absolutely terrific.